It's been nearly a year since Hurricane Maria swept directly through Puerto Rico, taking trees, roofs, powerlines and lives, with it. In the city center of Old San Juan, near the cruise terminal, very few signs remain. The major roadblock for Puerto Rico after the hurricane was never the rebuilding. It's the power. The lack of power was -- and remains -- the biggest hurdle for residents. While restaurants, bars, attractions and most hotels are up and running, there is still 10 percent of the population here without power in their homes. It was also the biggest obstacle in reopening the airport and port; not structural damage. Now, cruise ships -- some of the largest in the world -- are calling regularly, and the busiest season of the year here (winter) hasn't even begun. On days with more than one cruise ship in town, the population of Old San Juan (about 10,000 people) can easily double. While San Juan sees the tourism dollars that cruise passengers bring, we are told the ships are now calling, in some cases, for half the time. This puts a crunch on what passengers are able to see -- and operators are able to provide -- in a few short hours. 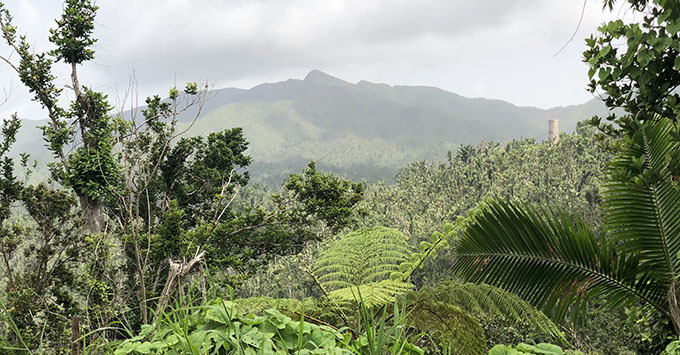 One of the most popular shore excursions -- a visit to sprawling rainforest El Yunque -- is now limited to just one trail and less than a mile of the previous 21 trails spanning about 28 miles of the U.S. national park. It's a see-to-believe type of place, and still worth visiting for a view of the mountainscape framing the spectacular countryside outside of the city center. The amount of cleanup required to open the park to visitors took until March; a waterfall is accessible, but the visitors' center is closed indefinitely -- lack of funds. 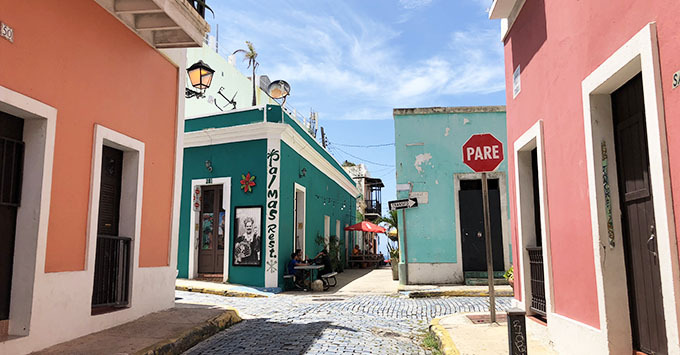 "Lack of funds" is a phrase we heard a lot during our time in San Juan, mostly referencing areas of public recreation around the city, like Parque Central or the wildlife center. In El Yunque, volunteers roam the grounds, and park rangers hope to have another trail open soon. Support is also needed for Bioluminescent Bay, a body of water that contains mesmerizing iridescent organisms. For now, the bay has lost its glow; the organisms eat the mangroves, many of which have been destroyed. "It will heal itself in its own time," says Jose "Yugo" Morales, a guide with Rico Sun Tours, "but it might take years." Visitors can still book kayaking and other tours to take in the natural landscape; but the glow is not a guarantee. Over at the Bacardi rum factory, it's business as usual. 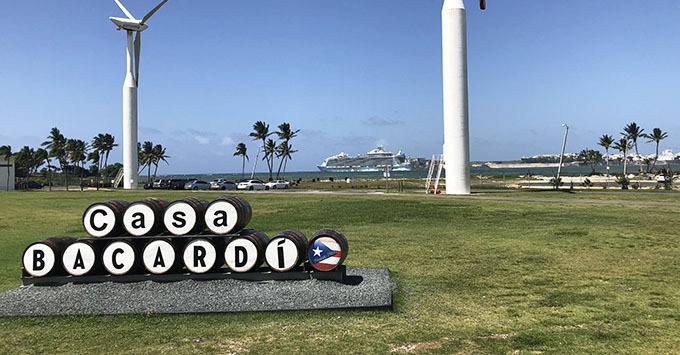 Where some resorts had to lay off employees after the storm, Bacardi remains a major employer and a boon for the economy; 80 percent of Bacardi's worldwide distribution is produced here. The facility in Catano, about a half-hour outside of San Juan, celebrates 60 years in 2018, and there's good reason to celebrate: Despite some damage on the grounds, no rum was lost as a result of the hurricane. Eric, our guide and mixology instructor, joked that it was due to the generous "angels' share," or percentage of alcohol that evaporates in the Puerto Rican climate. "The angels were nice and drunk, and they made sure to protect our rum." 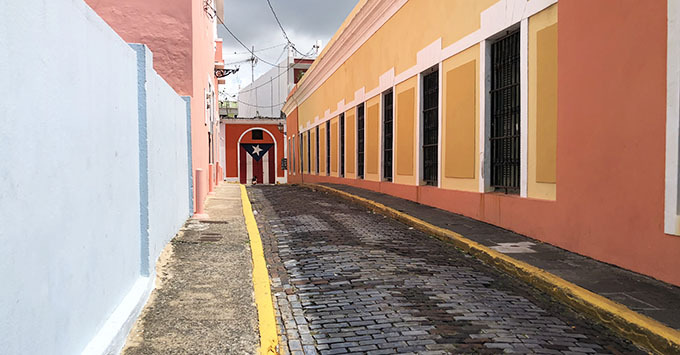 Just walking around in Old San Juan is one of the most pleasant experiences we've had exploring in a port of call. So much is free here: bilingual tours of government buildings like the stunning marble capitol (the only capitol building in the country with ocean views) or a trolley that will transport you to major tourist attractions. What is not free is cheap. Entrance to museums are a handful of dollars ($7 will get you into not one but both of the historic forts -- we're talking hundreds of years old -- and not only that, but it is possible to walk from one to the other in an afternoon). The same amount will also get you in to Museo de Las Americas, an architectural marvel that also houses six different mini-museums. 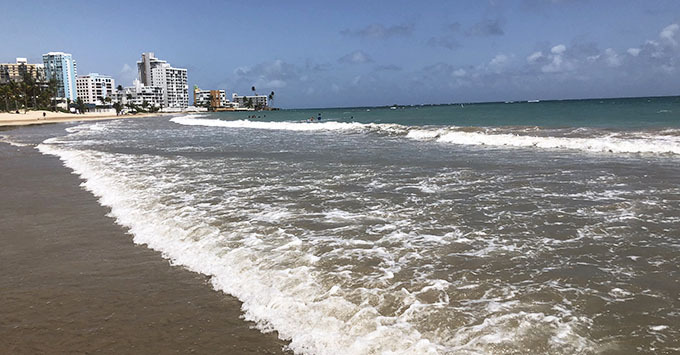 While it might seem that the beaches peppering Puerto Rico's shoreline would be most affected by the storm, they are in fact as impeccable as they are plentiful. Everyone you ask here will have a recommendation for their favorite spot -- Isla Verde, Escambron --- and they're all different; many within walking distance or a short drive from the cruise port. Some of the smaller, secluded beaches won't offer rental services or facilities without a bit of a hunt, but Condado -- just across the bay -- is open and filled to the brim with options from cabana rentals to standup paddleboard lessons. Beach access is free, everywhere. For anyone looking to spend a few nights before or after their cruise, the majority of hotels are up and running without generators. We're told the Ritz-Carlton and Hilton are both under renovation, expecting to open late 2018 or early 2019. El Conquistador, the largest resort around (one hour to the east, past Fajardo), is closed. "We have el mejor de los dos mundos -- the best of both worlds, here," Morales says. 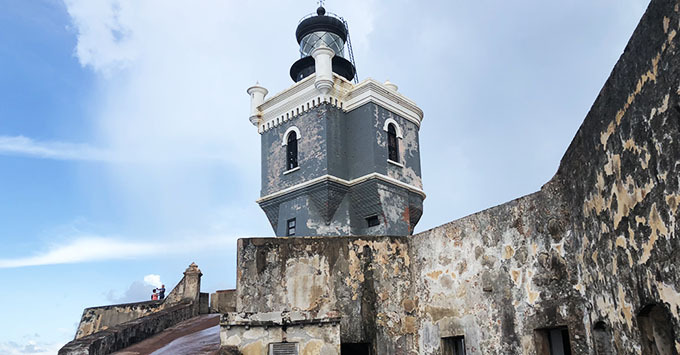 He means that on the island you experience the freedoms enjoyed as a U.S. territory, along with the rich culture and heritage of the Puerto Rican people -- a powerful confluence of Spanish, African and the indigenous. "We're not asking you where you're from, checking your passport -- no one bothers you here," says Morales. "You can speak English, Spanish, Spanglish -- it doesn't matter." 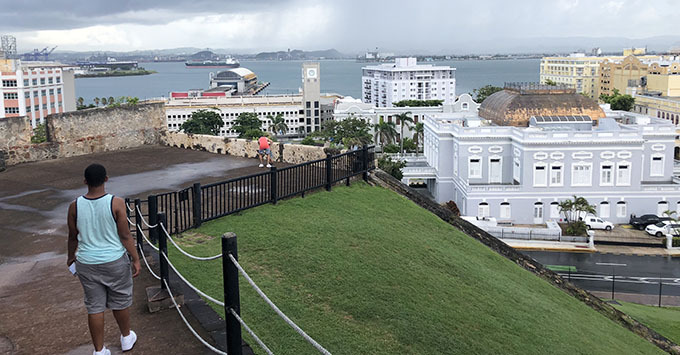 For cruise passengers, San Juan is also the best of both -- a port of call as well as a port of embarkation or debarkation. If you're boarding or departing a ship here, you have an excellent chance to experience more of the city, as well as the island. What struck us walking past the arresting, tropical-colored houses washed in moonlight, was how safe we felt on the streets at night. 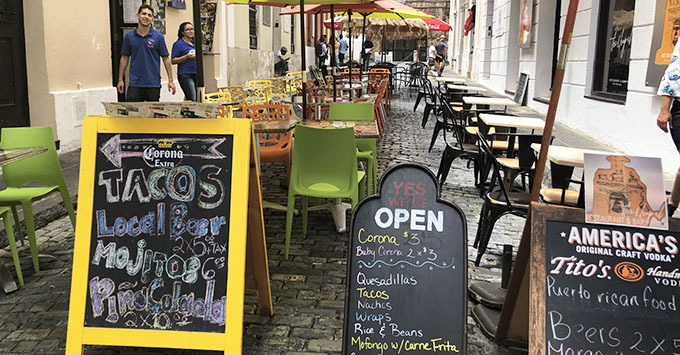 There is an ease to Old San Juan; people eat dinner early here, many restaurants are casual, family-style and the prices are very reasonable whether you're ordering a mofongo platter or a trendy cocktail (but be sure to go for a Medalla, the local beer, always served ice cold). Tap, tap, tap, tap-tap. This is the persistent beat of salsa drifting out of the door of a waterfront chinchorro. 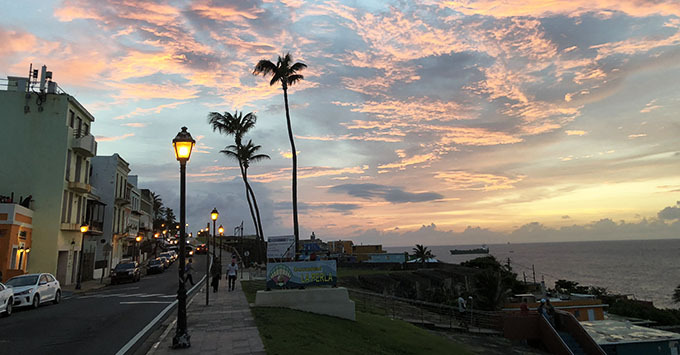 The word "chinchorro" denotes a casual place to barhop, serving traditional food and affordable drinks with live music; to a Puerto Rican, it's a taste of home away from home. To a visitor from the mainland, it might be hard to remember we, too, are home here, in part of our own country. Spending time in San Juan on either side of your sailing will certainly give you that appreciation. You get the experience of an entirely different culture, with the breeziness of no passport, no currency exchange, little barrier to language and some of the most stunning preserved monuments our national park system has to offer. Post-hurricane, a visit here is more than a usual port stop. It's a show of solidarity.